What are the National Apprenticeship Reforms? More effective training for their apprentices. To achieve these aims, some employers will be required to contribute to a new apprenticeship levy and there will be changes to the funding for apprenticeship training for all employers. Perspectives: Why are the reforms happening? Government research shows that economic benefits are generated when education and training helps individuals to achieve a higher level of qualification, increasing their employment prospects, productivity and wages. 82% of employers surveyed said they were satisfied with the apprenticeship programme and 70% reported that apprenticeships improved the quality of their product or service. prospects. 85% of apprentices said their ability to do the job had improved, and 83% said their career prospects had improved. Apprenticeships provide a typical return of £26–£28 for every £1 of Government investment in apprenticeships at levels 2 and 3. In other words, the Government sees apprenticeships providing excellent value for money for the taxpayer. As a training provider, how do I fit in? So … if an employer wishes to be the sole training provider (i.e train apprentices themselves), they have to register on the register of apprenticeship training providers and enter into a contractual agreement with the SFA. If the employer sub-contracts some/all of the training to another approved provider (i.e. you) they will act as the ‘main’ provider. The employer will pay for the services from the funding released from the SFA for the training for the relevant apprentice. you will be keen to meet the SFA requirements in order to release levy funding from the Digital Apprenticeship Service and get paid. How Can I Meet The Skills Funding Agency Requirements? In order to release funding, you will have to satisfy the Skills Funding Agency (SFA) reporting requirements. These include monthly data requests regarding the apprentices in order that you can get paid and claim any incentives due (i.e. recruiting a 16 to 18 year old apprentice). when they have completed their apprenticeship. Traditional methods have entailed compiling paper copy evidence of learner progress (i.e. classroom register checklists, self certification) for analysis. It takes time and resource to collate the various records. Paper records can easily go missing. Can you rely on all your apprentices to self-certify their training honestly? Ultimately, every training provider needs to engage, track, record in order to encourage apprenticeship to complete their training. The Government is championing innovative solutions to upskill the workforce of tomorrow. eLearning has been highlighted as part of a blended learning solution which employers can use to train their apprentices. In order for you to release funding from the levy, learners ultimately need to complete the requisite training. Currently, it is expected that the target figure is a minimum of 62% of apprentices successfully completing their apprenticeship. In 2018, this expectation will rise to a minimum of 65%. 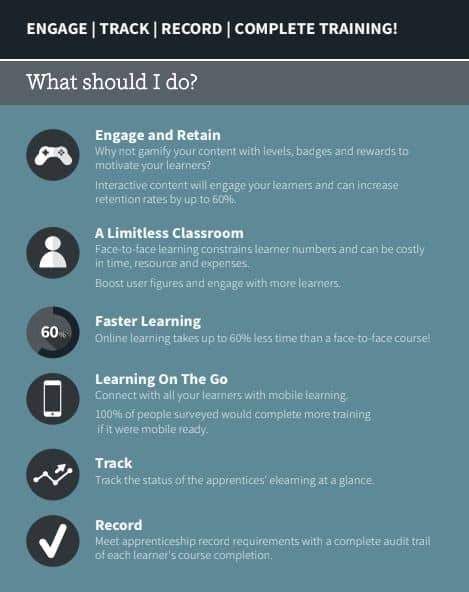 A good apprenticeship eLearning platform will incentivise learners to progress and complete their training. The apprenticeship shake up means that 2018 is a great opportunity for training providers to engage with the reforms and roll out effective programmes. However, if providers only take the minimum action on the key dates they will not fully maximise on payment opportunities. The message is clear. Flexibility and innovation are key. The Government has stated that employers can choose many methods to provide apprenticeship training by subcontracting (including those subcontractors subcontracting) some or all of the training. Therefore a collaborative approach is encouraged with an emphasis on blended learning (i.e. a program that combines the provision of traditional classroom methods with online learning). Ultimately, apprentices need to be engaged with their learning in order to be motivated to progress and complete their training. If the provider does not think about the individual learner and how they learn then ultimately they will fail to engage, retain and more importantly, take the apprentice to the completion of their training. satisfaction of the SFA that a training provider will have been successful as a trainer and a business. ← Totara 11: What’s New?